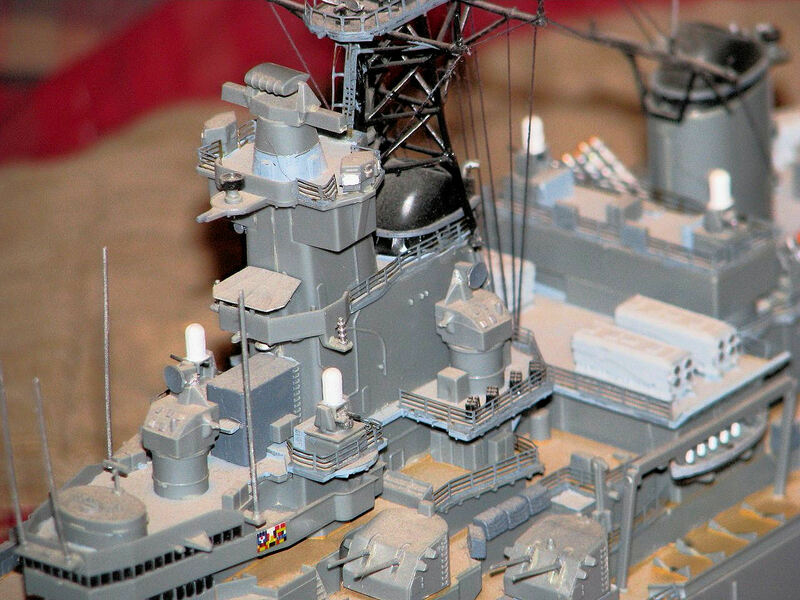 Tamiya began building large, 1/350 scale model vessels back in the late 1980s and has been doing so ever since. 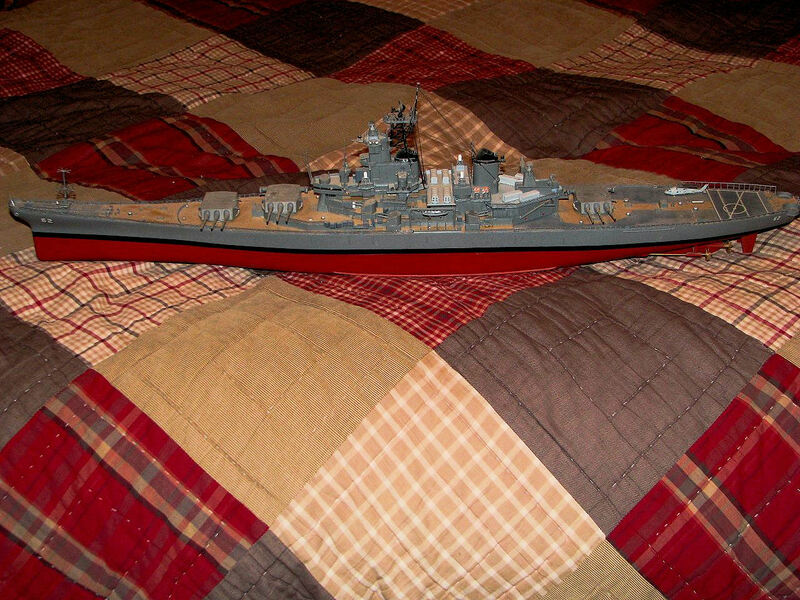 This model of the modernized USS New Jersey, which is an Iowa Class battleship that fought valiently in World War II. 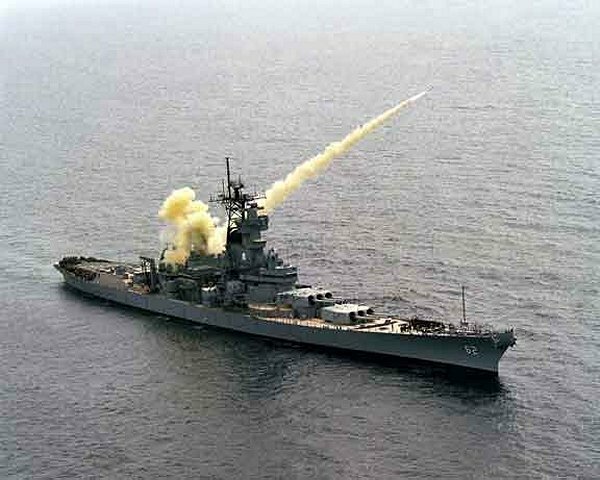 She fought in the Korean war, had her first large scale modernization in the 1960s for the Vietnam War where she supported troops on shore, and then in the 1980s was significantly modernized under Ronal Reagan's 600 ship fleet program where all four Iowa Class battleships received Phalanx 20mm CIWS, Box Luanchers for 32 Tomohawk missiles, tube launchers for 16 Harpoon anti-shipping missiles, a flight pad for anything from SH-60 Seahawk Helicopters to larger CH-47 transports, and all of the modern radars, sensors, communication, computer, and defense systemsto go with it. The model comes in a large, beautifully illustrated box, that is well built and very protective. Inside, the hull comes in a single large piece that is well modled without any excees flash. 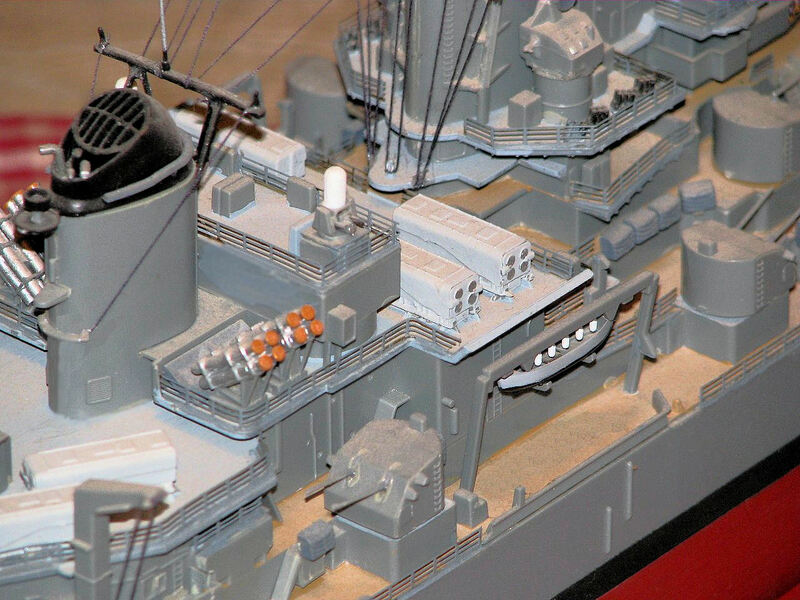 In addition, the main deck comes in three pieces, and then there are six additional sprues with over 360 additional parts. The parts are well molded and have very little excess flash. They are molded in a light, navy gray. 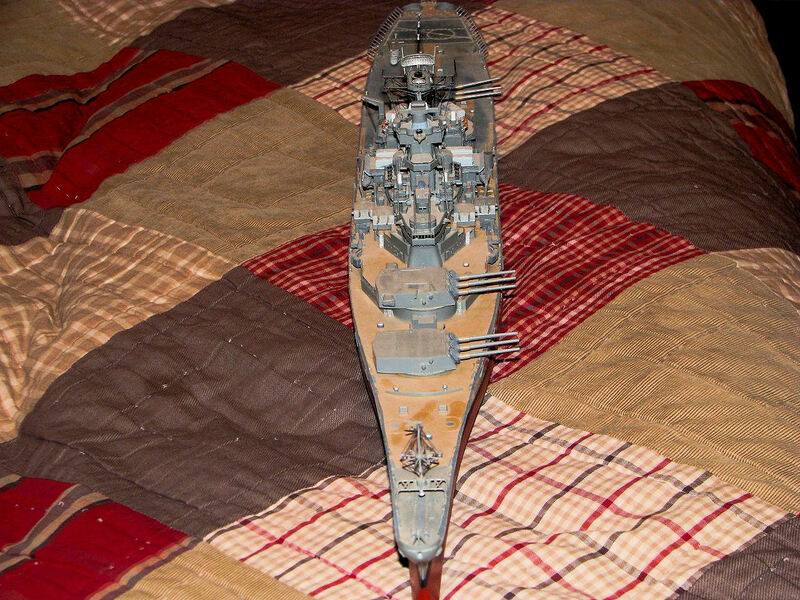 At the time I putrchased the model there was no specific PE Detail Kit for it, as there are now from White Ensign Models, Gold Medal Models, and Eduard. I did purchase the metal railing sets that were available at the time and used them extensively nad they made quite a bit of difference. 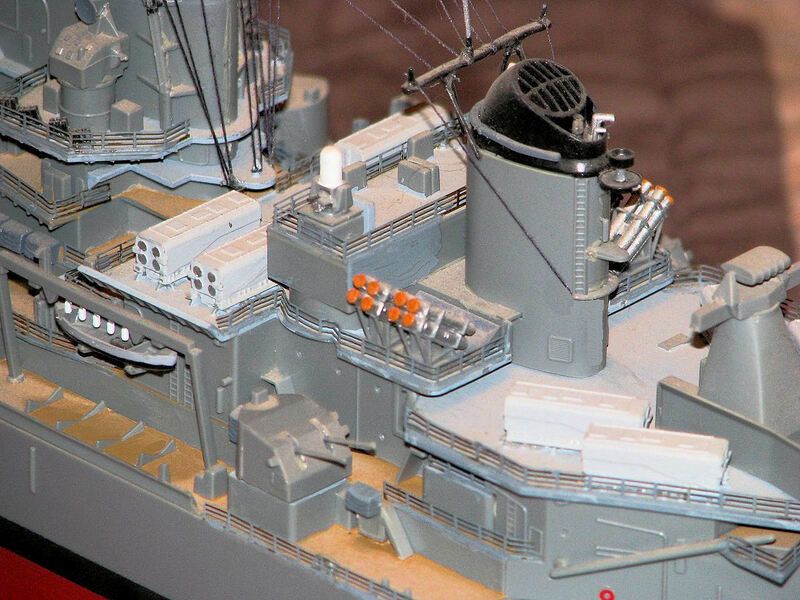 Today, any one of the 1/350 scale detail kits specifically for this model will add significantly more detail. I have considered buying one and replaceing most of the sensors and many other parts just to bring her up to date. The build took quite some time. I worked on her in the evenings after work and on weekends for almost threee months. The hull went together well with the main decking, though liberal use of rubber bands and some clamps were used. The guns and most of the vessel is finely detailed, making the painting of the windows on the bridge, and details elsewhere easier to accomplish. 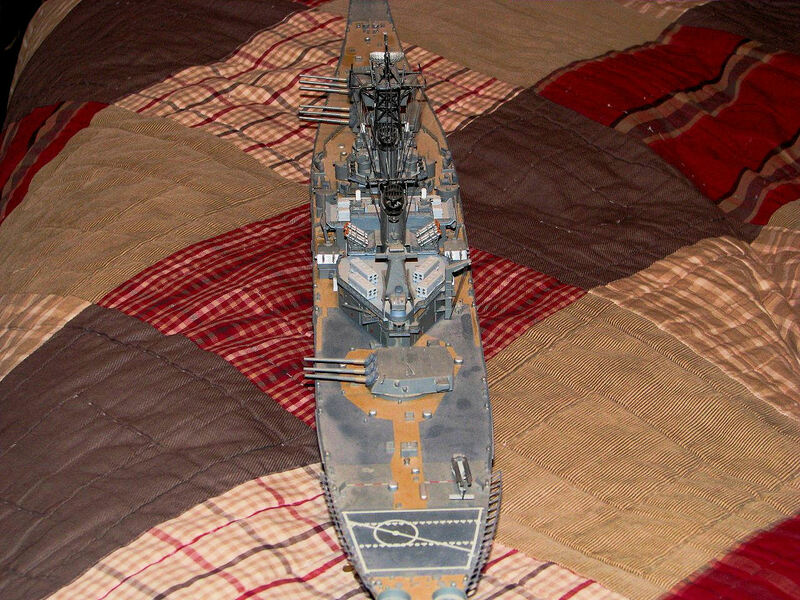 Use of masking was a must in getting the fine black stripe and then the hull red on the hull. 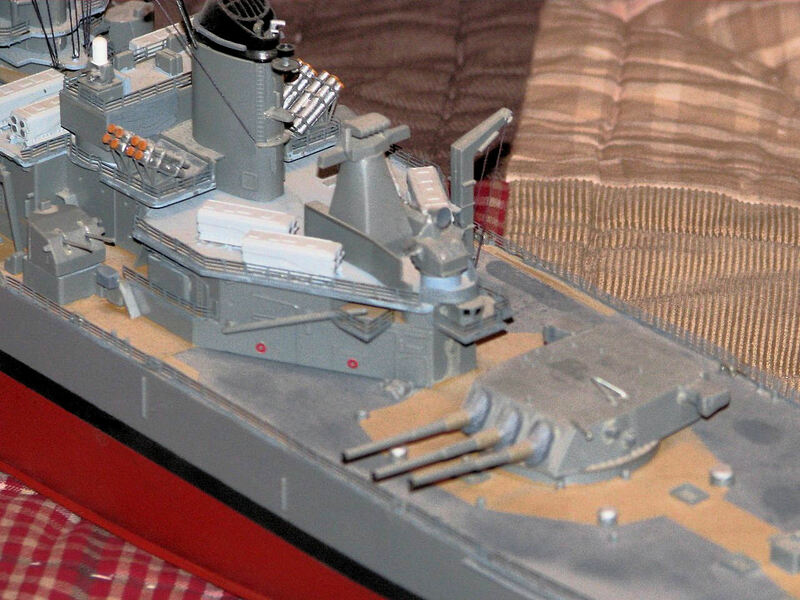 The main 16" guns can be made to elevate and roatte through their full motion. These plastic pieces are well done, but a set of metal barrels would add to the rea;ism and detail. 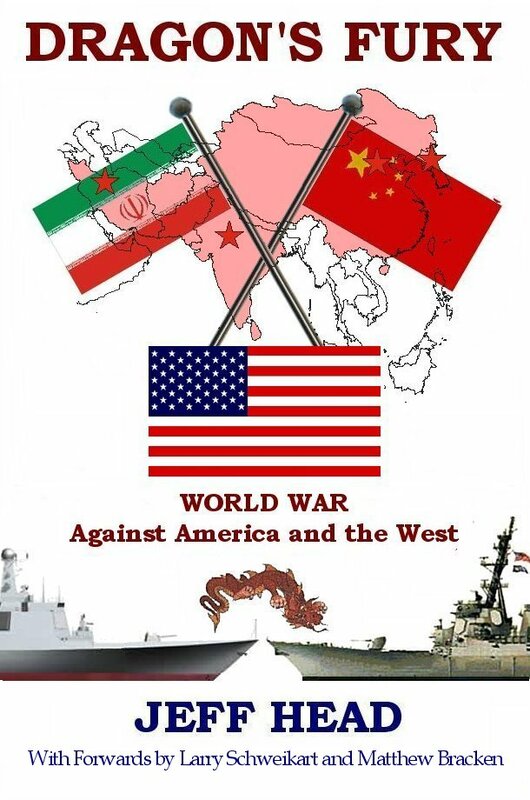 By studying pictures of the actual vessel, which is relatively easy to do now with the internet, the rigging and placement of ladders and stairs can be ascertained and completed realistically and accurately. The kit comes with two SH-60 Seeahawk helicopters, though there is no hangar for them. These were well molded too. 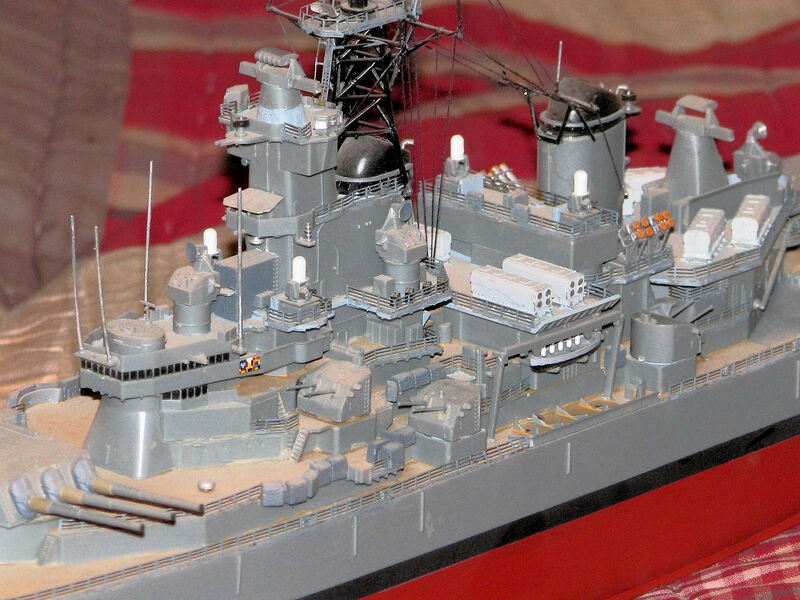 All in all the realism and detail of the vessel are quite good and this kit, though moderately difficult, would add a real star to anyone's collection.